This Crafting Life: Children's Model Search!!!! That's right! 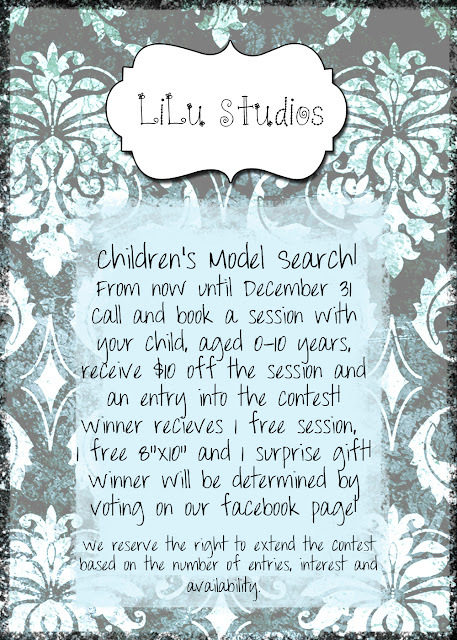 We're having a Children's Model Search! So tell your friends, your family and have them all take advantage of this special deal! Book a children's session at $10 off the normal price and be entered in to win as our children's model of the year! The winner will receive a free session, 1 free 8"x10" print, and one surprise gift (a $100 value!) If we have a lot of entries, we might expand to age brackets and give out multiple prizes, so tell everyone you know! The more that enter, the more prizes that will be given!!! The winner will be determined by voting on our facebook page, by number of "likes" received! We reserve the right to extend the contest based on the number of entries, interest and availability. Multiple children from the same family can each have their own entry, but only one $10 discount per family.